Building A Home For Our Family - Come watch the fun! Bring tools! We'll find a place for you to lend a hand. Building A Home For Our Family - Come watch the fun! Bring tools! We'll find a place for you to lend a hand. Come watch the fun! Bring tools! We'll find a place for you to lend a hand. Just had the inspection. I need to put in some additional GFI plugs in the kitchen. We’re finaled and we can move in! 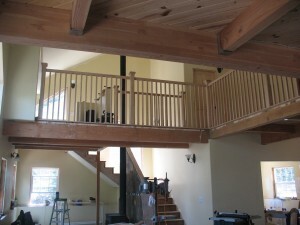 The last 2 foot stretch of railing is complete upstairs. On Saturday I laid the oak flooring we needed (yes, it does take pretty much all day to lay about 16 square feet of recycled 2-1/4 oak flooring) and today I got the railing up then started work on finishing the kitchen light install and our temporary deck railing infill (it’ll make more sense with a picture). 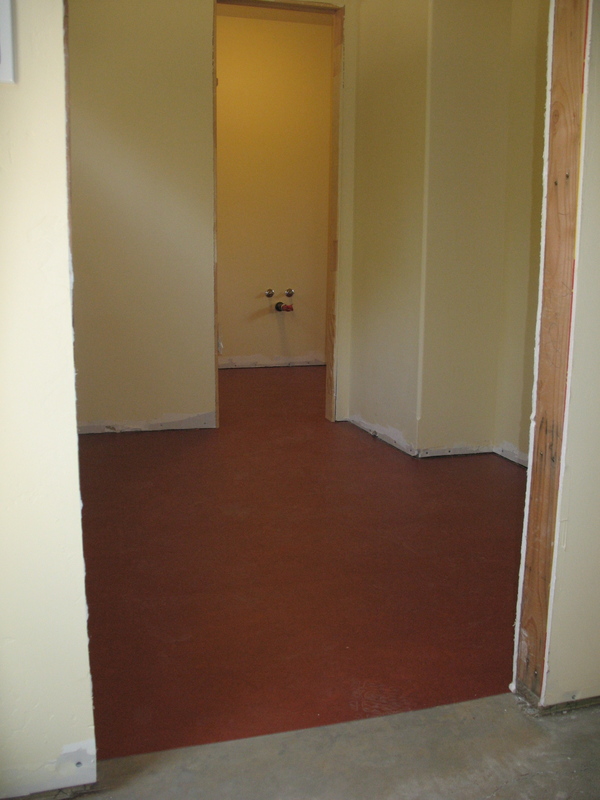 While I was working on the floor on Saturday, Amber finished the laminate flooring in the boy’s room (yes, she laid half about 40 square feet in less time than it took me to do 16). Amber’s also been working on bundling some of our leftover oak flooring so that we can get the master cleaned and get laminate flooring down there. The move-in list has been updated and it really does look like we’re getting close! 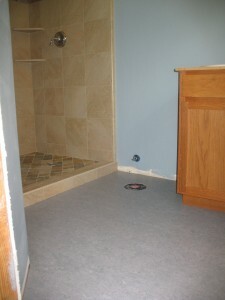 I installed the last toilet last night (in the master bath) so our plumbing is now officially done. I’ve also planned our deck and done a material take-off for it. Amber’s working on planning the shelves for the pantry so we’ll order all that material tomorrow and have it delivered on Friday. I expect to get the deck built this weekend and may have time for exterior lights as well. My goal for the 4th of July weekend was to get a working kitchen in the house. I started on Friday morning with backsplash material partly cut, counters still in full-size boards, range and dishwasher just occupying space (but out of boxes) and sink, faucet, garbage disposal and range hood still in boxes. I’m happy to say that we now have a working kitchen. A direct shot of the cabinet under our sink. I was trying to keep everything as clean as possible and keep space for storage. 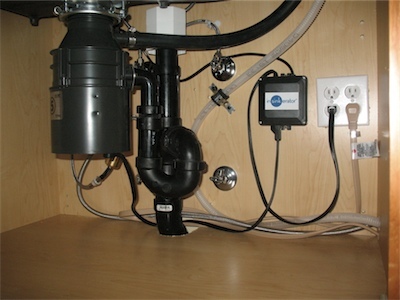 To that end, all of the hoses are run in the back and the waste line is very compact – though only having a single bowl sink helps with that. Since we have a pullout faucet and four water valves, I pegged the faucet supply line up on the left to prevent the pullout from getting hung up on anything. This shot is from further to the right – just another perspective on it. The white box near the top of the picture is our STUDOR® vent. For those of you unfamiliar with it, the black box near the plugs is the controller for our air switch. The dishwasher waste line is pegged to the back wall to keep it stable and prevent it from resting/rubbing on the air switch controller. I used some leftover 7/8″ hose as a buffer between the waste line and the plumbers tape. Our sink from above with all the bits and bobs installed. I’m not really happy with the air gap (on the right). It’s got a threaded plastic body and plastic nuts and they keep slipping the thread whenever I jiggle the hoses. I’m going to see if there’s a metal one avail and switch it out. Since our countertops are maple butcher block, I bought some maple planks to fashion the backsplash – that’s what you see here. 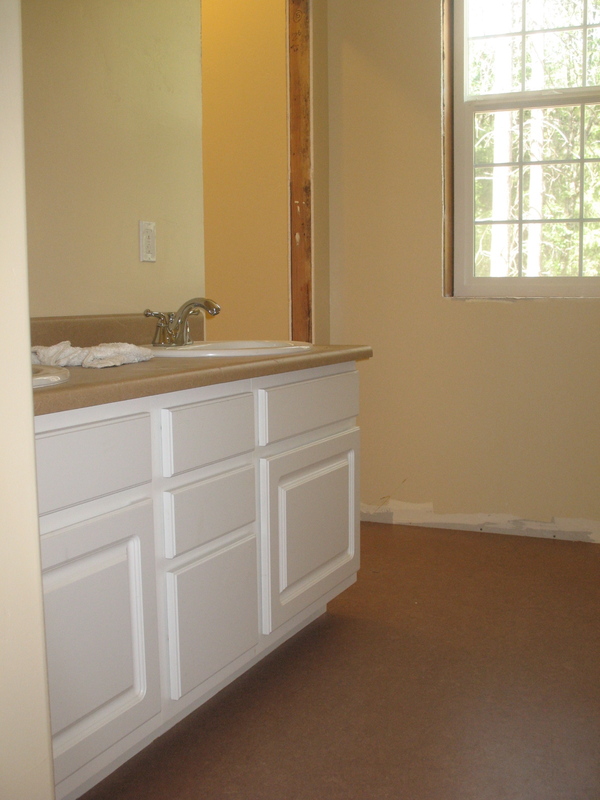 The counter tops are 25″ deep and the cabinets with drawer/door faces are also 25″ deep. It didn’t look very nice to have the countertops and doors/drawers in the same plane so one of the reasons for going with such a thick backsplash was to push everything out. 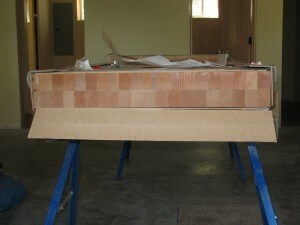 The backsplash is 1 3/4″ thick and we cut a 1/2″ thick, 3/4″ tall rabbet out of them. This gives us an extra 1 1/4″ of countertop past the cabinets and gives us a lip to hide any inconsistency where the backsplash meets the counter. 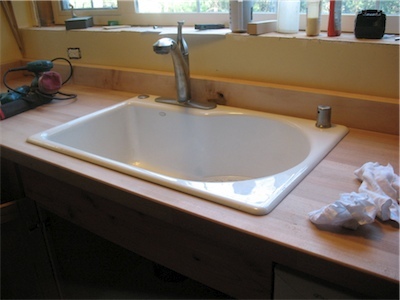 The sink again, from the side so you can see more of the countertop (and a few of my tools). The dishwasher is installed and working. I tested it briefly by starting the cycle and then canceling. Beyond making sure it worked, I also needed to ensure that there were no leaks. No, it’s not really blue – that’s just the protective cover. We’ll post some pictures of the range, vent hood and overall kitchen some time in the next week. Move-In Checklist to reflect these changes. Well, I haven’t been very good about getting change log posts up, have I. We’re still plugging away. We have someone working on the stairs and that will be done on Monday. Matt’s working on getting the kitchen together today and this weekend (after working on the oak flooring last weekend) and hopes to be done by the end of the weekend. I’ve been doing some more painting and cleaning, but most of the week has been taken up with kids’ activities. 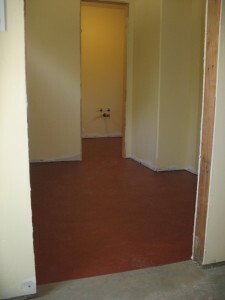 Tomorrow I hope to start installing the flooring we have for the bedrooms. The boys’ room is almost for that. I’m really looking forward to seeing that floor go down! If you look at the move-in list, you’ll see that we really are getting close… We might even be in our house in August. We shall see. I’m not feeling particularly excited, because it doesn’t really seem possible that we might be living there. It has just been too long of a process. We have hot water now! Our propane tank is all hooked up and the hot water heater works. This was particularly welcome because I spent part of the afternoon pulling up poison oak with my bare hands. 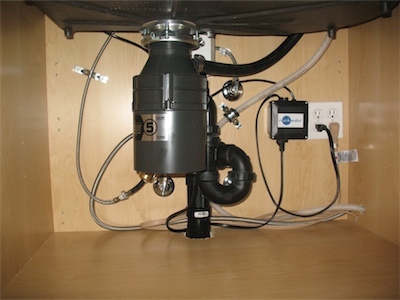 I was able to wash up with warm water rather than frigid, fresh from the well groundwater – a vast improvement. And yes, I know, this was not so bright of me, but it seemed like a good idea at the time. No rash so far, thankfully. Other changes – I oiled the end of the counters with mineral oil and finished marking the knob locations for the kitchen cabinets. First off, the railing. It isn’t quite finished, but we can at least let the kids upstairs without worrying so much! 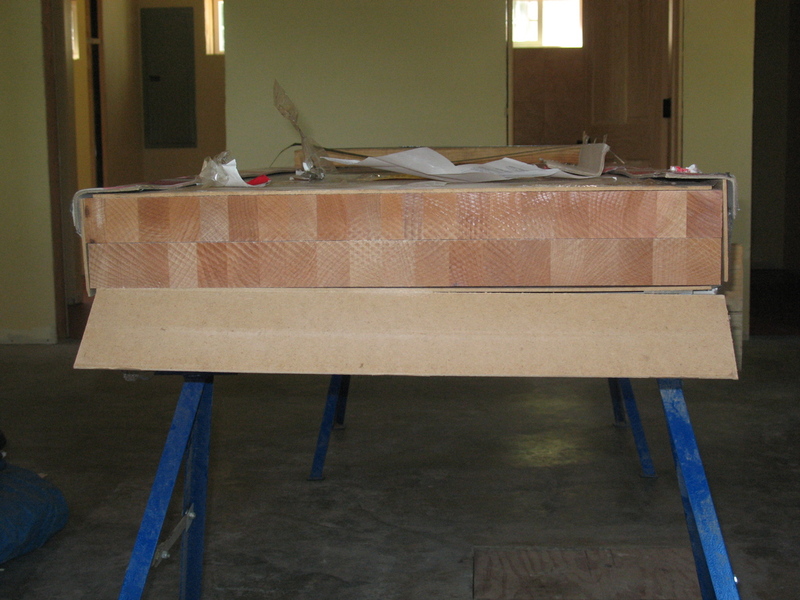 A shot of the end grain – they are finger jointed butcher block countertops, made by Perfect Plank in Chico, CA. We’re really making some headway on our list these days! Over the past week we did a lot of cleaning up and we got ready for our flooring installation today. We also had the propane tank set today and our kitchen counters were delivered. I installed plugs in Matt’s office and finally put a switch plate on the light switch in the storage area. I finished up the electrical outlets outside. I also finished painting the kids’ bath, fixed some drywall in there, and did some painting in the master bath. I started measuring the cabinets for knobs, but didn’t finish that yet. I spent a lot of time with the shop-vac and cleaned up a lot of dust and sawdust. 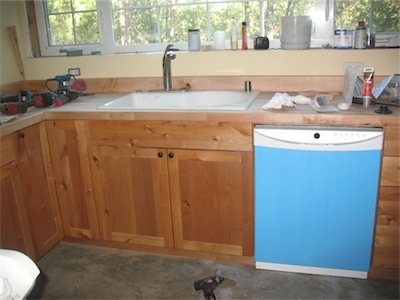 Matt installed the pedestal sink and faucet, nailed down the underlay in the upstairs bathroom, worked on the oak flooring upstairs, built a platform for the island future in the kitchen, and did a lot of picking up and putting tools and such away. As you can see from the move-in checklist, we’re making a lot of progress! This week we should be getting our appliances, our propane hooked-up, and possibly five more doors. 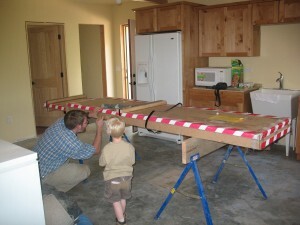 Once we have the appliances, Matt will be able to get those in place and then get the counters installed. Yay! 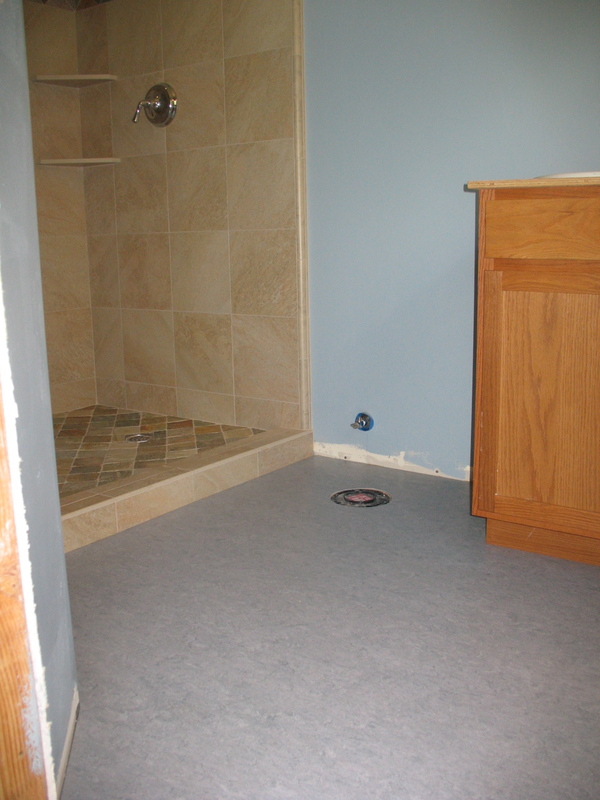 Matt installed the sinks, faucets and drains for the kids’ bath and master bath. 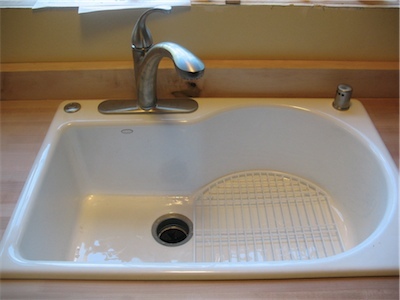 We now have four working sinks in the house. Matt did more trim work for the windows in the open area, then disassembled the scaffolding and got that loaded on his dad’s truck. It is really nice not having that scaffolding there anymore – although it certainly was useful. I updated the Move-In Checklist and as you can see we’re slowly making progress. Emphasis on the slowly part! I did a lot of cleaning up and organizing on Friday and through the weekend to prepare for having someone out to measure for our linoleum install. 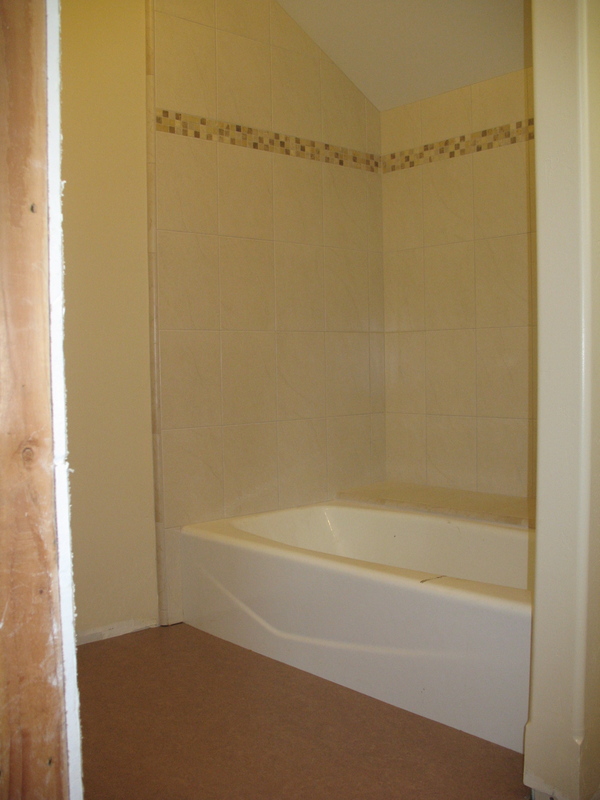 I also bought paint and I am working on painting the kids’ bath before the linoleum is laid down (currently scheduled for the 15th). I’ve put down a deposit and ordered the rest of our appliances (range, hood and dishwasher) and our kitchen countertop. I’ve ordered five more doors (pantry, utility door and pocket door, master bath, toilet area door for the kids’ bath). I’ve picked out the flooring for the bedrooms upstairs and for the open area and away room downstairs. Over the weekend Matt worked on some of the window trim, installed the venting grates for the freezer, hung the door for the kids’ bath, and worked on the underlay for the kids’ bath. 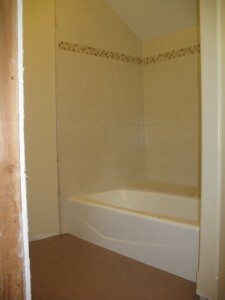 We also had a plumber come out for the day on Tuesday and he installed all the shower hardware and the hot water heater. We’re supposed to get our propane tank installed next week, so we should have hot water soon. FYI – I updated the Move-In List.